The compassionate, personalized care you already know is now backed by an even larger network of resources, expertise, innovation, and locations across Coachella Valley. In 2017, Desert Regional Medical Center joined with Hi-Desert Medical Center and East Desert Medical Center. The result is a new community of care: Desert Care Network. 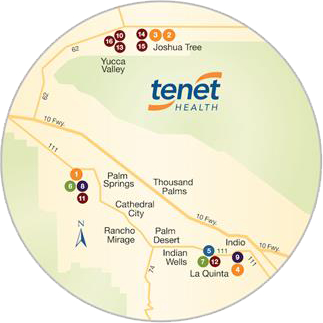 With three hospitals, specialty centers, and the largest primary care network in Coachella Valley, Desert Care Network sets a new standard of service and dedication to the health and well-being of the people of Coachella Valley.